Learn how to do the 3A Blueline Boing. Just like that. Now, before you learn this trick, you really have to make sure you have a good understanding of the 1A trick boingy boing. 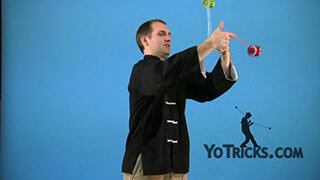 It is really important to make sure that it is not just a trick that you do kind of wildly, but that you have a lot of good control on it. 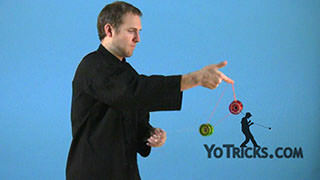 By control what I mean is that you are able to actually do the trick and kind of control the speed and tempo of the trick. You can make it speed up, you can make it slow down, and yet still do the trick. The second thing is before you can start, we are going to have to teach you a boingy boing variation called Over-Under Boing. 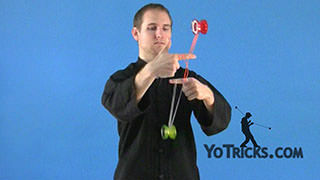 You can do this, just with your dominant hand, get into a split bottom mount. 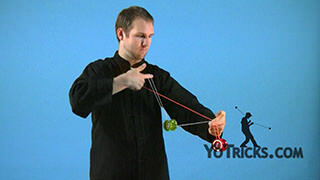 What we are going to do is when we do the boingy boing, instead of doing front string and then popping back to the back string, what we are going to do is hit the front string and actually let it drop under your finger. You see it will come back a little bit. 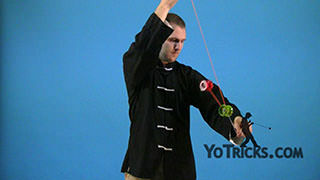 Then you are going to use that forward momentum and pull up on your finger to come up, hit the back string, and let it slide underneath your index finger again, pull up. 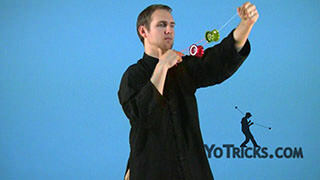 So you see you kind of get this kind of up and over motion over your opposite index finger. A little bit of a rock. You can kind of get good at controlling the tempo on that too. 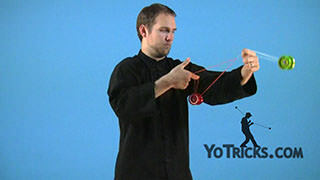 Once you have worked on that a little, you have gotten comfortable with it, essentially what we are going to do is combine those two versions of boingy boing, regular boingy boing is what your dominant yoyo will do, and over under boing is essentially what your non dominant hand is going to do. Before we get started, I am going to show you a very broken down version of the trick that is slowed down here in a second. But what I want to do is explain a couple of things. One is the trick is going to be done a little bit slow. 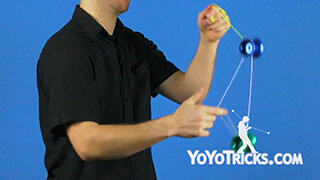 It is important to realize that the speed of the trick is being set by your top yoyo. What you are going to find is that the direction is also being set. 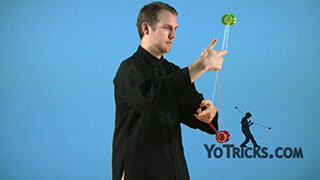 So when your top yoyo moves forward, the bottom yoyo will also move in that same direction, or back. 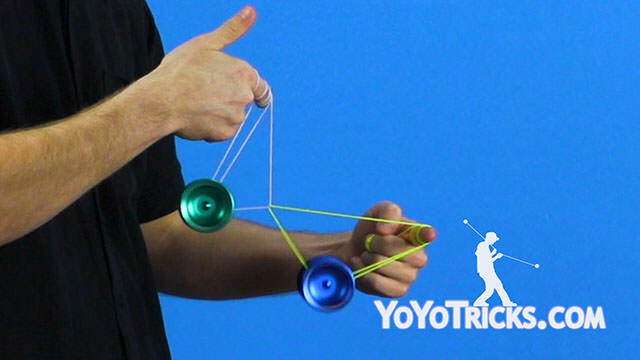 The other thing you will find is that in the trick, there is going to be maybe some extra boings that the top yoyo does when the bottom yoyo does not move. 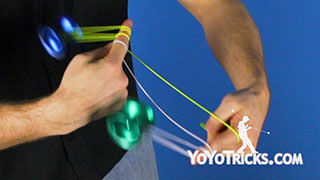 When you first get started that is especially true, you might find it is comfortable to do a couple of extra boings before you move the bottom yoyo again. That is perfectly fine. 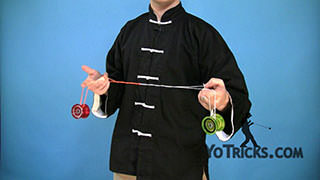 In fact, when you get really good at the trick, you will find that for every time the bottom yoyo moves, the top yoyo does two boings, it goes forward and back. So to get started, we are going to get into a Blueline Mount. It is a good idea to shorten your string. Either you can do Barrel Rolls, I like to do just a flourish. You want to make sure that your non dominant hand is in front. 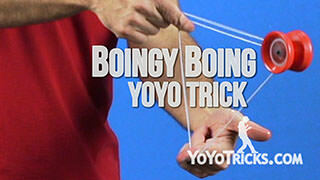 To start, you are going to do a boing. 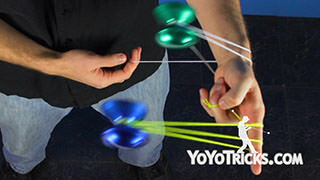 At the same time you do that, you are going to mount the yoyo over your finger. Then if you do another boing, on the boing back, you are going to dismount. 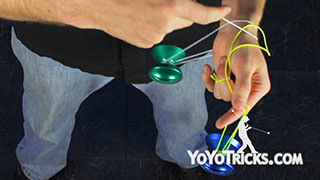 So that is kind of the first place to get started at, is to really work on as you do the boing forward, you mount the bottom yoyo over your opposite index finger. 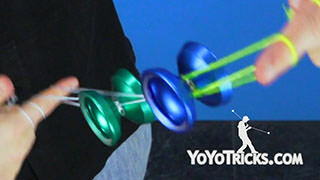 And as you do your second boing on the boing back, you unmount the bottom yoyo over the index finger. You want to get comfortable with that. What we are going to do next is actually the very opposite, so I will show you that too. If we get back into our Blueline Mount, shorten our string. 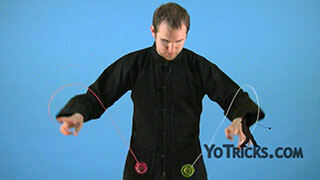 So we have mounted, on the boing back we unmount, we are going to do another boing and on the boing back we are going to mount the yoyo on the opposite side of the index finger. Then forward and we will unmount. So you can see, again, what we have done is essentially an over under boing. 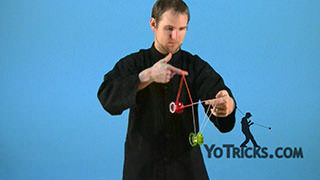 As this yoyo moves forward, we are mounting the yoyo in the same direction. Then we do the boing and as it moves back we unmount. 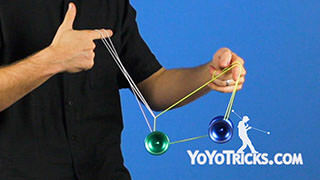 We do a boing forward and on the back we mount the yoyo in the same direction. As we boing forward we unmount in the same direction. So that is the basic pattern. Again, you really want to work on it slow, if you have to do extra boings it is no problem. Once you start to get a little bit better at it, and you are feeling more comfortable, you want to try and work on your pacing a little. 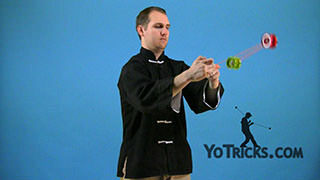 Try to get it a little bit more smooth, really work on getting that timing just right. 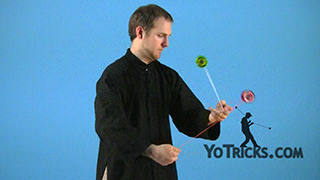 Again, ideally there are two boings forward and back for every time that the bottom yoyo moves. One final tip that is going to help with this trick is as you are going into boingy boing, if you are mounted in the string, as you do it you will notice your dominant yoyo might slide down towards where the kink is. And that kind of messes up the trick. 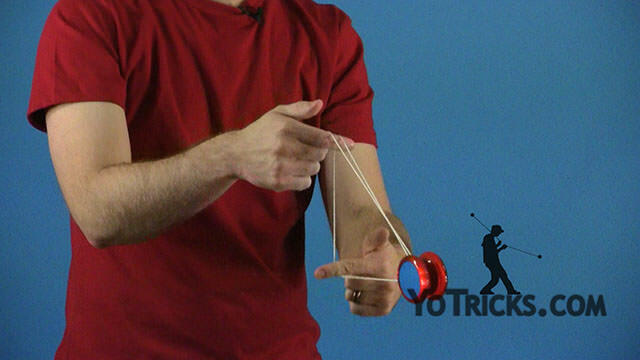 So the biggest tip for that is to actually take this loop over your finger here when the yoyo is on it, and pinch that and you can actually just practice regular boingy boing like that. It is a good idea just to get comfortable with it, because when you are in the blueline boing, you want your thumb pinch. 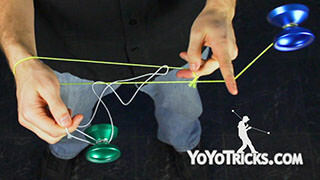 That will help keep the yoyo in the right distance and the string proportions correct, which makes the trick easier. 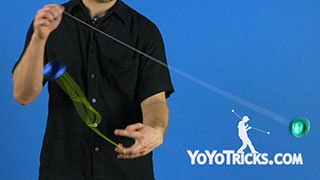 Other than that, this trick just takes a lot of practice. Once you have got it down, you just want to keep working on building up your speed and your tempo, little by little, just like you would with regular boingy boing. Once you have got it, that is Blueline Boing.